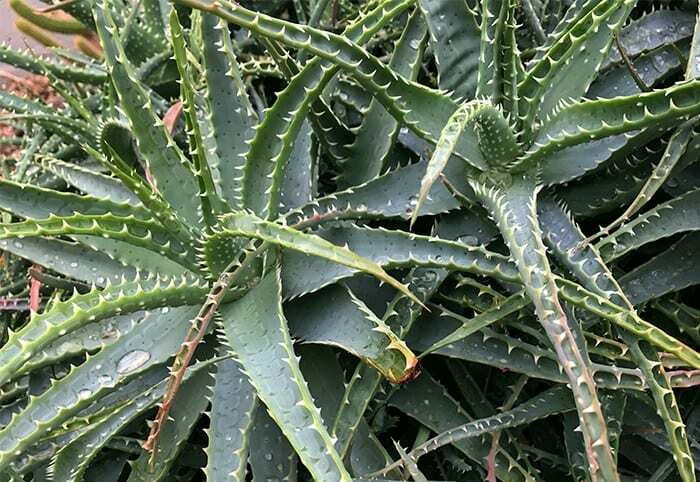 Aloe Vera, a popular cactus-like succulent, is one of the most useful medicinal plants and is very easy to grow. When I was a kid, summer sunburns and Aloe Vera went hand-in-hand. I hated sunscreen and suffered pink and burning skin as a result. When my mom saw my new sunburn, she cut a large leaf off of our Aloe Vera plant and rubbed the cold slimy gel over my skin. It smelled like musty feet and left a yellow hue on my skin as it dried, but it cooled the burn instantly. Now I grow my own Aloe Vera plant which started as a “pup” on that same plant. I still cut leaves every summer to treat my sunburned skin, minor cuts, and the occasional poison oak rash. I now even blend the gel into juice, despite the smell. Aloe Vera is easily propagated and under the right conditions (hot and dry) can grow to three feet. A mature plant will produce “pups” or small plants from its base. Use a sharp knife to cut these pups off of the parent plant. Place them directly into the ground or into a pot filled with cactus mix. Your new plant will be genetically identical to the parent, so choose your pups from a healthy plant. Aloe Vera is very low maintenance perennial that prefers well-drained, dry soil. It only needs water if there will be several months without rain. Harvest large leaves from your Aloe plant as you need them. Simply cut the leaves with a sharp scissors or a knife near their base. To use the sap directly from the plant on your skin, cut the leaf lengthwise and rub directly on the affected area. You can also scoop out the gel-like sap and store it in a container in the fridge for one week. Aloe is found in many skin care products. But if you grow Aloe Vera, it’s easy to make your own Aloe Vera gel that will surpass the quality of what you find in the store. Only use this gel on your skin, do not ingest it. Cut a large outer leaf off of your Aloe Vera plant. Cut the serrated edges off of the leaf. Place your knife under the rind of the leaf and slide it through, peeling back the rind. Use a spoon to scrape the sap from the leaf and place it in a blender. Add a few drops of Vitamin E, Vitamin C or grapefruit seed extract as a preservative. Scoop your Aloe Vera gel into an airtight container and refrigerate. Your gel will stay fresh for several months. Author Bio: Rick Perillo is the founder of The Carrot Revolution, digging deeply into gardening, food, and sustainability.